Buon giornio and happy Friday my friends! 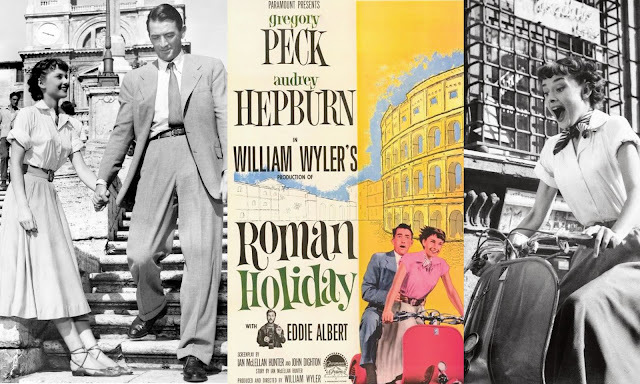 Today we have a classy, playful and romantic segment of Reel Inspiration, starring the always adorable, timelessly chic Audrey Hepburn, and the gallant, handsome (and high-waist-trousered [?]) Gregory Peck in Roman Holiday! Movies from the '40s and '50s have always been among my favorites, and when I watched this one for the first time in middle school I remember thinking two things: 1) I really want a scooter and 2) I want to be riding that scooter in the outfit Hepburn wears throughout this movie. I have accomplished the first goal (my husband and I ride a 1980 P125X Vespa painted sky blue), but the second has yet to come to fruition. Maybe this post will give me an extra push. 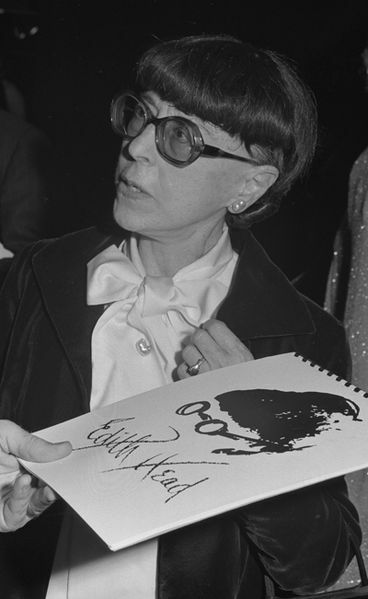 Edith Head, who still holds the number one spot in Academy Award nominations (35) and wins (8) for costume design, received one of her Oscars in 1953 for her work in this movie. This is an amazing feat considering two things: that Hepburn wore the outfit you see pictured above in 90% of the film, and it had to be styled with "black and white" in mind, since that's what the movie would be filmed in. Edith, however, was the creme de la creme of fashion designers during Hollywood's Golden Age, and if you were an A-list celeb back then, you wore her clothing. So with her brilliance on deck, the costumes were sure to succeed. Check out this picture of Edith below...remind you of anyone? 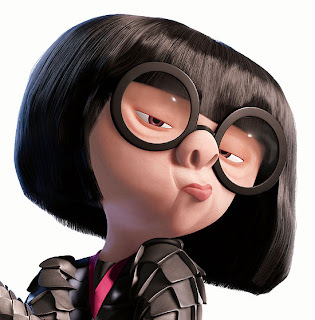 If Edith was as fun in real life as Edna is in that movie, I definitely would've wanted to run in her circle. But, I digress; let's get back to the task at hand: Hepburn's fabulous frocks during her character's Roman adventure. What say you? Are you inspired to scoot around ancient ruins, start a fight at a party and be swept away into the romance of Roma? Me too! Let's go!